OptiFine HD for Resource Packs can help you alot. I think there are those people who’s PCs are very slow and minecraft is lagging. Well, I would advise these people to use a minecraft mod called Optifine. This mod optimizes your minecraft game world and increases the FPS. And of course, the gameplay will become much better and more interesting. • Download the .jar file from the link below. • Open the .jar file you just downloaded. • Download Forge API. Install Forge API. • Copy and paste the .jar file you downloaded (in step 1) to %appdata%/.minecraft/mods. If folder with name "mods" doesn't exist, just create it. 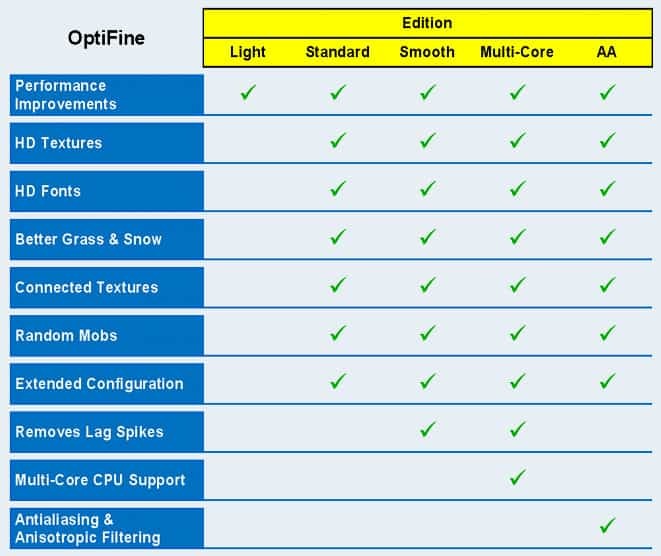 *Credit for creating and developing OptiFine HD goes to sp614x. It is designed and compatible with the following minecraft versions: 1.13, 1.12, 1.11, 1.10, 1.9, 1.8, 1.7. Right now OptiFine HD has 1402732 views.